There are few trout streams in Leicestershire, and when an opportunity to fish the Gopsall Flyfishing Club’s water was posted for bids on their 2010 Fishing Auction by the Wild Trout Trust, I spent part of the last evening for online bids, placing and upping mine, but ultimately was unsuccessful by a meager £5! Thanks to my internet guru, Peter Little, I now know how success is achieved through this system, but am too mean to reveal this until after next year’s event. Our first attempt to meet in August was foiled by heavy overnight rains two day before, and new arrangements were agreed by phone and two Mondays later, it was up early and onto the M40/42 to meet Mark. Like in so much of Britain, when you leave the motorways on which we depend, there are interesting places to see. From the road to our assigned meeting place, I could have diverted to Appleby Magna, or to Sheepy Parva, or even to Norton-Juxta-Twycross, and I felt like a Medieaval traveller. 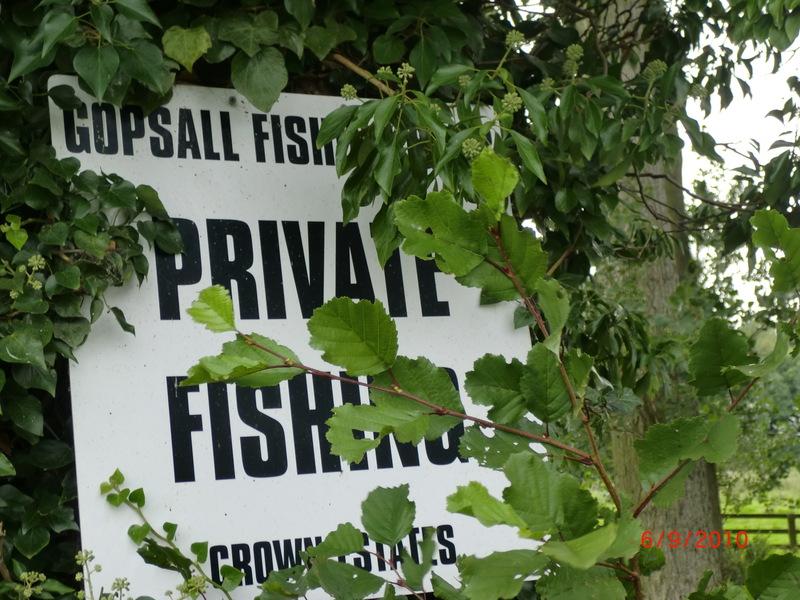 This was warring territory for I was not that far from Bosworth, and the site of civil horrors in Cromwellian times. Now all is peaceful except for the trundling of monster tractors and 12-wheelers taking bales of dried grasses to winter storage. There was a blustery easterly wind about making casting impossible on the first stretch that Mark took me to. But this early part of our encounter enabled me to learn a lot about him. A commodity trader (oil) and committed country man, he is already a major contributor to the Club’s improvement programme, which had begun with assistance from the EA, and grant monies from amongst others’ the WTT. 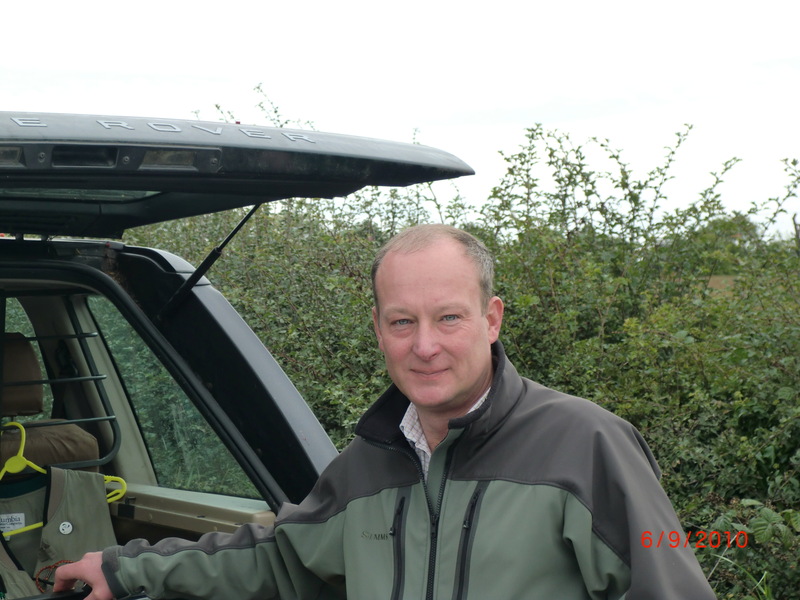 His love for this project led to his taking a course in Environment Management (of waters) at the University of Derby, and then opportunistically, having left the trading world, he was offered a key role in the newly formed, Anglers Trust, as their Environmental Campaigns Manager, with his important role sponsored by the WWF. For his work on the Sence, he has been honoured with the award for Best Amateur Conservation Project by Orvis/WTT in 2007. Working the riverbank with him is like listening to a walking encyclopaedia, and is completely fascinating. His love for what he is doing is inspiring. 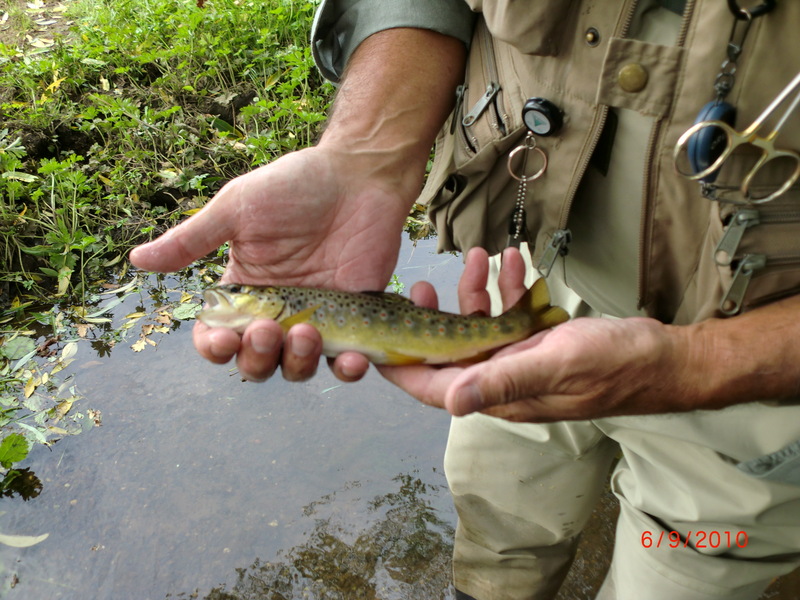 His river has a head of wild trout and is stocked with 800 triploid browns each year. It has a small coarse fish population, too. We drove to a part of the Club’s 5kms of water where he knew we would be sheltered from the wretched wind. We saw fish for the first time, but they were probably dace or grayling, an introduced species, and another part of the improvement programme. There was no fly life and I was nymphing with a gold headed PTN, but apart from one distinct pull, I was attracting nought, and when it was well past noon, the pub called! In the afternoon, and whilst the temperature stayed around 17c. the wind was up again and we fished a tight stretch where we were bombarded by leaves and sizeable twigs. 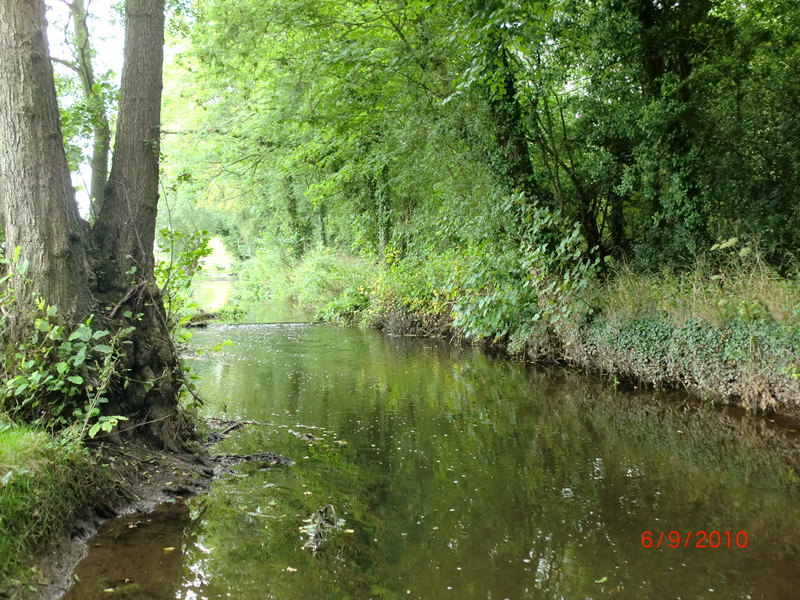 Below a small weir, I could attract no interest from the pool and I lost a cast in an overhanging branch. Jerking it free, I found that I had lost my braided leader and had no choice but to tie a new leader around a knot made at the end of the flyline. I reasoned that the folk in Africa had no need for sophisticated Loomis kit, nor perfectly tied polycarbon this and that, and are better fishermen than me without it, so I pressed on. And only minutes later, and casting into a run below a line of rocks angled across the river, below an alder, I felt a tug from only inches of water, and in seconds I netted a little beauty of eight inches or so. I felt humbled….but lucky to have been guided and with success by the expert who is Mark. We spent the remainder of our time together, just wandering along his river, whilst he gave me a tutorial on bank management technique. The work that has been done by this 35 strong Club is impressive. Nettle beds have been cut back and willow saplings have been planted. Quality fencing has been built to widen the bankside margin and contain cattle invasion, new bridges placed, structures have been installed to narrow channels and speed flows, exposing gravel beds and improving weed growth, and importantly, creating spawning areas. Mark is also very busy with the Anglers Trust. This new enterprise harnesses the separate influences of eight smaller bodies into a better, bigger body representative of our pastime. From his explanations, I know from my own experience in the world of Public Affairs, that this is a good move, and it clearly has the ear of DEFRA officials. I hope that Government cutbacks which will be revealed next month, will not be detrimental to their endeavours. When we parted, and with respect for what the Anglers Trust is doing I gave Mark a cheque for them, and I have sent the WTT a cheque, too…..next year, with my new knowledge, I hope to secure some other interesting rivers to fish in the WTT Auction catalogue !